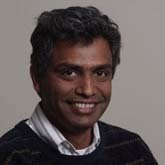 Subbarao Kambhampati (Rao) earned his Bachelor's in Electrical Engineering at the Indian Institute of Technology, Madras, and his Master's and Doctoral degrees in Computer Science from the University of Maryland, College Park. Rao directs the Yochan research group which is associated with the AI Lab at ASU. He is the recipient of a 1992 NSF Research Initiation Award, a 1994 NSF young investigator award, a 2001-2002 College of Engineering teaching excellence award, and a 2004 IBM Faculty Award. In 2004, he was named a Fellow of AAAI (American Association for Aritificial Intelligence, now Association for Advancement of Artificial Intelligence). He was an invited speaker at AAAI 1996 and ICAPS 2003. He has presented tutorials on planning and databases, including one on automated planning (AAAI-2000), one on information integration on the web (AAAI-2002), and one on planning graph heuristics.